Point of Return by Lloyd Tosoff is an action thriller set in Great Britain. The story centers on a struggling, naive accountant Ian MacLeod and his entanglement with a murder conspiracy concocted by the Glaswegian underworld. He doesn’t become involved by choice because it is his friends who choose to mess with the Glasgow mob and their violent ways. He left the city, but after becoming an accountant, being in a loveless marriage, and losing his job, he ends up going back. He meets an old friend and a stranger when he arrives, and the mystery and conflict begin to envelop him as he realizes he has to fight for his life or lose it. This novel is part of a “double novel” series, but Point of Return stands on its own as a snappy thriller that follows Ian Fleming’s Bond series. The first chapter begins with MacLeod still in Glasgow and his decision to leave the city, and then we jump eleven years into the future to when the real action starts, and the story picks up from there. In many ways, Tosoff follows the regular beats for the unsuspecting hero to be swept up into a conspiracy and for a thriller, this trope is not a particularly unusual one. The real grit of Tosoff is how he chooses to have MacLeod deal with his past and personal connection to Glasgow instead. A victim of abuse at the hands of a violent stepfather, his inner demons come through in small bits and shapes his character. The reader is gradually introduced to these pieces of MacLeod’s past, and for the reader, it helps invest more of themselves in the narrative and our precarious hero. The atmosphere and pacing do wonders for this book, which is critical for a thriller and Tosoff manages all of these elements quite well. The few times that the novel does become predictable it’s uniquely colored by MacLeod’s past struggles and how he faces them. 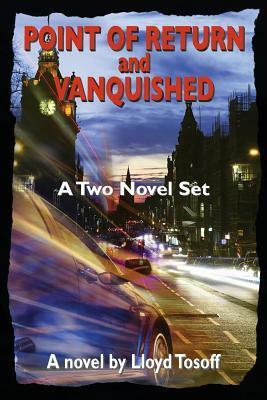 I hope that his past conflicts come to a better resolution in the sequel, Vanquished, which takes place immediately following this novel, because I can’t wait to see what happens. This novel is a perfect fit for fans of crime and spy thrillers, and fans of Ian Fleming may find a welcome new home among Tosoff’s pages.